I have been so busy and then I finally had a three day weekend... Saturday Valentina went off to camp for 4 days, I hope she is having a lot of fun... the weather has turned out to be wonderful for her. 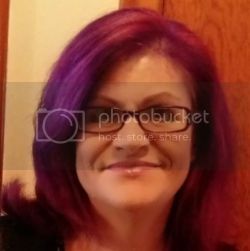 I spent the whole day at the salon getting my hair cut and colored... it's a school but they do great work and for a really decent fee. Sunday I was wiped out, all I did was relax and get caught up will all my blogs... I had taken 3-4 days off reading and commenting... I really needed the time to refresh. Today I spent more time cleaning and organizing... now that I have things in order, I just want to keep it up... I don't want to go back to where I was, it was overwhelming and depressing. One of the best decisions I made was to hire the lady that has helped me get my life and house in order. Since I am organized with my house, I have a strong desire to cook at home, instead of stopping off at the grocery store every morning for lunch, I pack a tasty and healthy one at home. So food wise I am feeling great, I am using My Fitness Pal and I'm tracking my food daily... I am not feeling like I am missing out as I am enjoying the fruit and vegetables that are available this time of the year... What I am struggling with is exercise, I don't know why I can't seem to push through like I did before. I just did it, I never used any excuses and I didn't care if I sweated... Lately all I do is rationalize about not exercising... which frustrates me as I know that moving more is a great way to get in shape and be healthy. I feel like I need to find that switch inside of myself that I found a few years ago... I was in the zone, nothing got in my way... I know that all I really need to do is just start, I have done it before, I can do it again... I don't have to go all out like I did before as I think that was a bit much for me and one of the reasons ended up getting hurt. I don't even want push to myself like I did before... I just want to start again and build on it over time. I have decided that I am going to exercise 3 times a week for a half hour each time per week to start with... it is something I can do so that I don't get hurt or give up. I would love to do it before I start work as that is the coolest time of the day, I am still waiting to work from home, I am not sure what the hold up is... all I can do it just be ready for when it happens... As soon as I do, I could exercise before work, have a shower, start work and kick off my day with a good start. Hi Launna. I hope you enjoyed your long weekend. I know what you mean about exercising. It can be quite hard especially when you are doing it alone you kind of have to motivate yourself. I start slow and slowly add more time. I usually go on the treadmill and do Jillian Michael's videos. I think you have the right attitude Launna! Little by little and step by step you will do it. You are so right changing your train of thought can be a challenging thing, but so worth the effort. Wish you all the best on all your goals this month. Dear Launna, I hope you soon can work from home. So far the weather is good and commuting may be not heavy. I'm glad most things are going very well. Good to hear the healthy diet is going so well! I'm a real fruit lover so I really enjoy my five a day. I should probably take you as an example! Hi Launna! It's great to hear there have been more positive developments in terms of your living space, and you've been inspired to keep up the cleaning and organising. It's amazing what a difference it makes. Sometimes exercise can feel like a chore, but if you focus on the feeling it will give you, then I think you'll be more inclined to get started! Hopefully with a moderate approach, you'll feel the benefits of more exercise and also avoid getting injured, so you can stick to your health goals long-term. I so understand your struggles and what you are going through. It is so hard to find that inner 'oomph' a second (or third) time. I have been in your shoes and they are ill-fitting shoes, aren't they? You can do it! You did it before and you can do it again...just baby steps--you don't have to be perfect (which I know that you strive for)--you just have to do the best you can at the moment you are in. Yep....you are determined and positive. Way to go and I believe Launna, anything you set your mind to do, you're going to do it!!! I have faith in you. Hugs and wishes for a great week. Dearest Launna, I'm almost setting a track record for being Missing in Action but the past couple of days had been hard on me. Especially my personal well being. That being said now that I've managed to kind of tackle the issue, I believe I'll be following the same routine that you do. Well being, personal development. Thank you be for being ever so motivational! 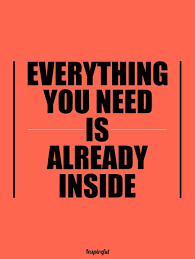 Totally agree: everything You need is already insidie! Great post Launna! Hope Valentina is having fun/had fun at camp!! I firmly believe that everything is in our heads, so your logic definitely makes sense to me! That's a great start. With great qill power one can do wonders. I think you will do great and set your routine for exersice. Best wishes. Yay for eating at home! I've been on an exercise kick. After our car accident in April, I've had a terrible time with my back--enough that I wasn't sure I'd be able to hack writing. 4 months of treatment later... Physical therapy was the best. I just finished and am now on my own to keep up the exercises. 1/2 hour each morning while I study. It's painful, but I know from experience if I don't keep it up, I will be in a miserable place. Unable to write. It's pretty strong motivation. 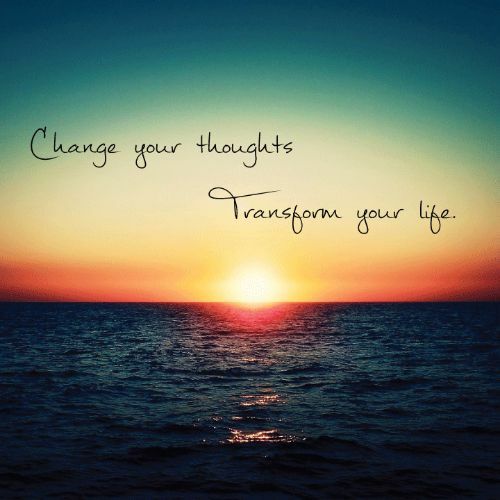 By controlling our thoughts, we can control our outlook on life. Great Post Launna! i love the Quotes, amazing Inspiration! Acho importante isso de começar os exercícios aos poucos! Iniciar os exercícios com força total pode não ser muito bom. Devagar você consegue chegar onde quer! I'm just nodding my head here, Launna. Yes to changing our minds and transforming our lives. Yes to all these. It is nice that Valentina went to camp, I never did when I was a child. I hope Valentina is having fun at camp! You are on the right track. Hopefully, it will come and all will be great soon! Yes, the heat is so awful here, I don't even want to think about getting out in it to walk. I know I should do something on the basement steps, but I haven't even had time for that lately. All the best. Hope you get the GO AHEAD to work from home, soon. I am sure that you will achieve your goal. You always do and thus encourage all of us to follow your foot steps, by writing nice posts like this one. God bless you. I know that if I don't watch out I will be so off. Now I know that I am not the only one. I should always come here and check out as you always have something I get without looking for it. A little bit of organization actually does wonders! I am a very messy person, and somewhere I feel that trait even affected my relationships - it may seem a strange metaphor, but I wish I could iron out the creases of my relationships in the same manner as I can iron and sort out my clothes. I'm getting my life back on track, trying to start from where I left - starting from the last memory I have of myself being happy and being "me" - I think I can build myself from there! Even though I don't visit this space regularly, your words give me comfort. Thank you for that! You are an inspiration! I'm sure you'll be able to stick to your goals and accomplish all that you've set your heart for! Best Wishes Always! As always I am 4 days behind in my reading and I hope by now the change it thoughts is starting to really settle in. It is difficult! There was a time when I worked a job that allowed me to go to the gym at 5:30 AM. I would shower there and then go to work. It was a little extra effort but boy were those great days! It started me off so well! Fingers crossed for you! I'm pretty sure she had great fun at camp. And I'm glad you got a chance to pamper yourself. I once got my hair done at a beauty college. It was pretty cheap and I was happy. I try to read blogs on Fridays only so I can work on other things during the week. I've kinda gotten used to that routine and it works. Glad you rested up for a few days. Food wise Ive done a lot of protein shakes, fruits and salads lately. I haven't been exercising too though and that can't be good. Have a fab weekend Launna. Gosh, Launna, you have no idea how happy I am to read about these great progress you're making with your life. I remember you telling me that you don't enjoy cooking so to actually read that you're now cooking at home, wow, good on you! I think it is a great idea to start slowly exercising three times a week. That sounds manageable and once you make that a routine, it will be easier to add another day or two when you decide you're ready. You certainly don't want to overdue and get injured again. You need to find an incentive for yourself. Like once upon a time for me was if I exercised after work at the gym on my jobs side of town then I didn't have any traffic going home. I just had to pack my bag everyday and be ready. When that off time came in the afternoon I asked myself, do you want to sit in traffic or go to the gym. Then the drive home was wonderful. I hope you can find an incentive like that at least until you start to work from home. Then you can pop up and get it over with. 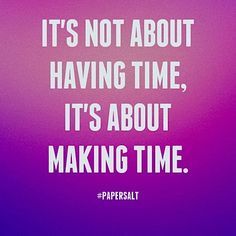 That quote about making time and having time is so true and applies to a lot. I hope Valentina had a wonderful time at camp. I think your exercise plan sounds good and makes good sense too, once you get into the routine I'm sure you will find it easy to maintain - and be so pleased you are doing it! Enjoy the rest of this weekend, and have a good week ahead. What a sweet post! I can't wait to see a pic of your new haircut. I can relate to not wanting to be in the same place as time passes by. Inspiring post. Have a Lovely day with your sweet Valentina! I love the title of this post. Very inspirational! I'm in exactly the same place exercise-wise right now. I have yet to find that switch again. Three times a week sounds like the perfect regimen though. I think the key is to just start again! Have a lovely weekend. sounds like we are going through similar things. I've spent the last week sorting out EVERYTHING. so many things had piled up over the past year, or maybe more, physical, mental, digital. I needed a purge and a good dose of sorting and organizing. I'm feeling much lighter. I'm struggling with eating well and working out too, and am hopeful that this will become easier once I feel things are in order again. it's strange how hard it is to keep these things up, and how we go through good phases just to see it all collapse, over and over again, and how we have to start over and over again too. I want make time, sometimes I am so busy with so many stuffs that I feel I didn´t enjoy my day and sometimes I go out and see the sky and breath because I need feel a bit alive. You're right. Although it doesn't feel like it sometimes, we ALL get the same 24 hours every day, so we do HAVE the time. It's the management of that time that gets problematic. If something is a priority for you, you WILL find the time to do it. Your plan to exercise a half an hour at a time, three times a week, is manageable. You can do it. Go for it! Kudos to you for staying on track. I love home cook food but won`t mine to eat out from time to time. All the best with without exercise and work. Launna, eu tenho muitos pincéis! Mas confesso que não uso todos! hehehe! Dear Launna as you said, the change is inside, in the head. We are what we think. Our life begings every day in our thoughts so we must be careful with that because after thought come feelings and the the kind of action we make. The best is that we can recognize where we fail and then... change it. Your positive attitude will definitely help you to transform your life. I love your optimism and energy! Getting started is always the hardest part for me. I have to take it one day at a time. I know you will be successful! Have an adorable day my lovely Launna. Ciao Launna! Have a great day! Ciao Launna, a lot of kisses for you babe! Launna! Também gosto de marrons! E aquelas cores são perfeitas para sobrancelhas mais claras e também mais escuras. I hope you are doing well, which you seem to be. Thanks for all your kind words on my blog! Have a great weekend! !